The Budget Ordinance is the county’s financial plan for the next fiscal year, which begins July 1, 2019. It determines how much money each department receives to provide services such as fire and police protection, public transportation, and water and refuse collection. It also determines how much money is collected from the public through taxes and fees. In addition, the budget sets forth the amount of grant money offered to community organizations and establishes funding levels for capital improvement projects, such as road paving, park improvements and water system upgrades. The Mayor’s Fiscal Year 2020 Budget Proposal includes the executive and legislative operating budget for the ensuing fiscal year and capital program. The proposal may be viewed on the County website at https://www.mauicounty.gov/DocumentCenter/Index/4774. April 4, Mayor Hannibal Tavares Community Center, Social Hall, 91 Pukalani St.
You can also send written testimony to edb.committee@mauicounty.us, referencing EDB-1. To view information requests made by the County Council to the Departments, please refer to the Budget Session Agency Question Log. Testimony will be accepted at any of the posted meetings in the Council Chambers throughout the deliberations and decision-making process. 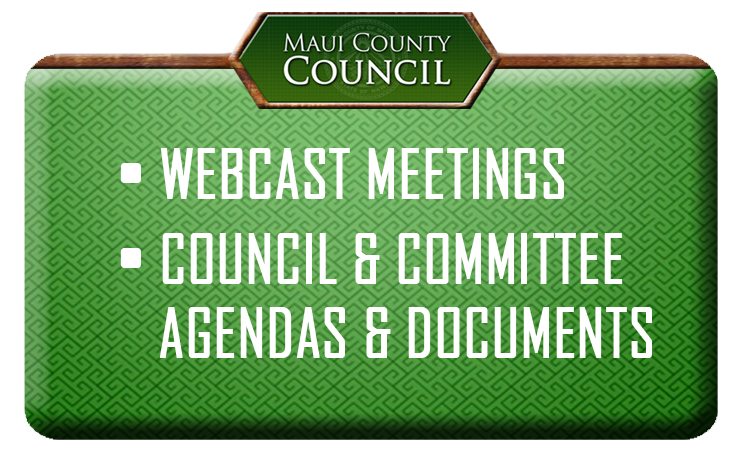 Each meeting agenda will be available at MauiCounty.us/agendas and testimony will also be accepted via email at edb.committee@mauicounty.us.